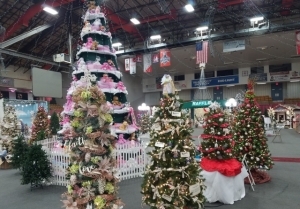 The 22nd annual Festival of Trees is getting underway this weekend and will run through Wednesday, November 14th at the David S. Palmer Arena at 100 W. Main Street in Danville. The theme of this year’s event by OSF HealthCare Sacred Heart Medical Center is Let Heaven and Nature Sing. 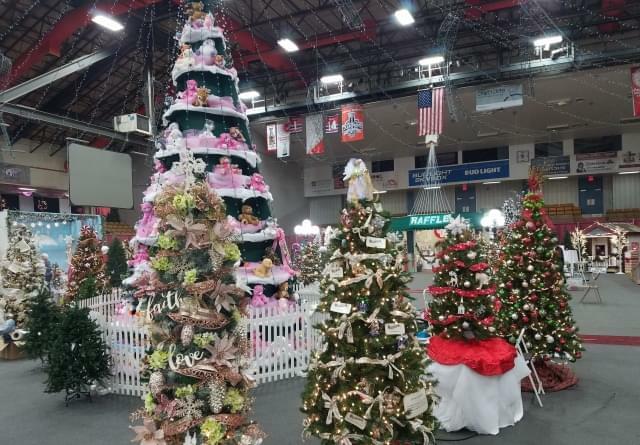 Featured attractions include the themed trees and showcases on the arena floor, the Junior Parade of Trees, Elfin Evergreens and Gingerbread Village, Children’s Craft Area, Holiday Café, Gingerbread Bakery, Festival Stage, Main Street Raffle House and the Senior Hospitality Area. Saturday, Nov. 10: Children’s Day, 10:00 a.m. – 8:00 p.m.
· The Children’s Holiday Breakfast (tickets available), 9:00 a.m. – The Festival officially opens with the Children’s Breakfast. Special guests will include Santa and Mrs. Claus and there may be a Grinch sighting. Children will enjoy a story, games, photo booth and a get to make a craft. Advanced ticket required. · Paws for a Cause Tree – Create memories as you build your own bear or other stuffed animal to support the Women’s Health Center; or donate one to OSF Children’s Hospital of Illinois or other local child in need. A fun and creative process with no sewing involved. While supplies last. · Comedy and Magic Show featuring magician, Daniel Lusk at Noon, 2:00 & 4:00 p.m.
· Princess Tea Party (Noon – 2:00 p.m.) “A Royal Party” will feature Samantha Hasselbring, 2018 Miss Illinois County Fair Queen and other special “royal guests.” A light luncheon, hair and makeup, story time and a special dance lesson will be part of this magical afternoon. · Light the Night Family Pajama Party (tickets available), 8:00 p.m. – It’s a GRINCHTASTIC pajama party! Come dressed in your most festive pj’s and join us for a night FULL OF FUN!! Party with mean ole’ Mr. Grinch, and get your picture taken with him too. The Danville Noon Kiwanis Club will provide yummy pancakes while you enjoy classic Christmas movies on the big screen. Other activities include a glow-in-the-dark dance party, crafts, popcorn, photos and more. There will also be appearances from Santa Clause and Thing 1 & Thing 2. Sunday, Nov. 11: Pickle + Family Day (Kids & Veterans FREE), 11:00 p.m. – 6:00 p.m. Families can search to find the six hidden pickle ornaments for a chance to win one of six prizes. · Rock and Roll Lunch (tickets available), 11:30 a.m. – 1:30 p.m. – Put on your jingle bells and get ready to rock around the Christmas tree at the McDonald’s Rock n Roll Lunch. McDonald’s will provide a tasty meal plus a sweet treat. Guests will make their own instruments and an ornament fit for a rock star, plus get to try their hand at real musical instruments and sing their favorite Christmas tunes. Advanced ticket required. ads and their daughters, or moms and their sons to get all dressed up, and share a memorable evening together. Dinner, desserts and a souvenir photo are included with each ticket. Bring your son, your daughter, your nieces and nephews, your grandkids or….all of them! · Wine and Painting Party (4:00 – 7:00 p.m.) – Guests create their own special holiday keepsake with step-by- step instructions from Emily Chappel of Top Notchery. Ticket also includes appetizers, drinks and Festival admission. Advanced ticket required. · The Crystal Ball (tickets available), 5:30 – 7:30 p.m. – Bring the whole family for dinner and dancing with the Brat Pack. Formal attire is recommended. Advanced ticket is required. Monday, Nov. 12: 9:00 a.m. to 8:00 p.m.
· The Ladies Holiday Luncheon (11 a.m. – 1:30 p.m.) – Let heaven and nature and an angelic chorus sing while you enjoy an elegant luncheon under the twinkling lights with friends, family, or co-workers. You will be served a delightful meal catered by Applewood Foods as you sip on wines handpicked to accompany the menu. Advanced ticket required. · Free Admission with non-perishable food donation for the Kid’s Backpack program (5:00 – 8:00 p.m.) List of requested items online. · Family Night Bingo (6 – 7:30 p.m.) – Includes spaghetti, salad and breadsticks from Jocko’s, 5 games of Bingo and admission to the Festival. Each family receives a goodie bag. Advanced ticket required. Tuesday, Nov. 13: 9:00 a.m. to 8:00 p.m.
· Cheers to You – Bingo & Fun (5:30 p.m.) – Bingo for our guests 21 and up. Included with your ticket are hearty appetizers, adult refreshments and 10 games of Bingo for fabulous prizes.Advanced ticket required. Wednesday, Nov. 14: 9:00 a.m. to 3:00 p.m.
· Thousands of school-age children will take a field trip to the Festival of Trees and get their very own special guided tour, complete with a visit from Santa and the other Festival mascots. Again this year, the tours will include a focus on literacy. Students will be treated to a special presentation story and each teacher will receive instructional materials and treats for their class so every child can take home the magic of the Festival. Volunteers are still needed for a variety of duties throughout the event. Call the Festival volunteer line at (217) 213-4490 and leave a message or email Mary McMillan, volunteer chairperson atmcmillanm@danville118.org. Special thanks to Platinum Sponsor the Julius W. Hegeler II Foundation and Diamond Sponsor Iroquois Federal. 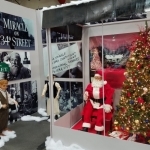 Proceeds from the Festival of Trees will assist in providing new 3D mammography equipment for the Women’s Health Center at OSF HealthCare Sacred Heart Medical Center.